I finally decided to experiment with something other than American buttercream! I wanted to try a meringue, or something with cooked sugar, but I didn’t have a candy thermometer and I honestly had never really worked with egg whites before. But I found this recipe for Vanilla Swiss Meringue Buttercream on Annie’s Eats – she adapted it very slightly from Martha Stewart’s recipe – and I decided to give it a try. I picked up a candy thermometer at Walmart and it seemed to work pretty well. Then it came to putting the sugar/egg/salt mixture in the KA mixer until it formed “stiff peaks”. I had a general idea what this should look like, but never having done it before, I was flying a little blind. But I think I got it right. Next, I added an un-Godly amount of butter. I mean I like butter as much as the next girl, but when a recipe calls for it in pounds – yikes. 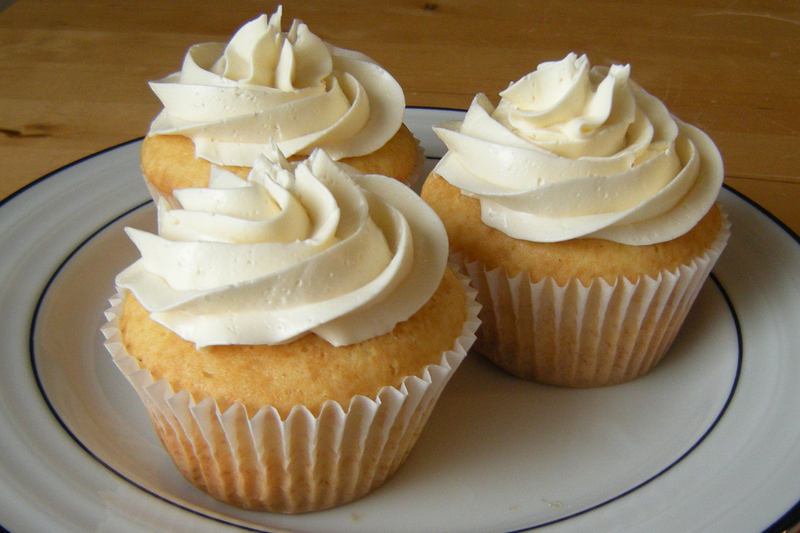 So, after finishing the icing and piping it onto some plain white cupcakes, the verdict is…YUM. It is very delicious and it definitely solves the over-sweet issue with American Buttercream. But it is SO RICH. I couldn’t even eat one cupcake! I’m actually not sure I’d want to ice an entire cake with it. Next time, I may try to adjust the butter/sugar ratio and see what happens. Jen is my future sister-in-law. She is marrying my husband’s brother at the end of April! She was also a bridesmaid in my wedding and I am a bridesmaid in hers, so I was very excited to throw her a shower (with my mother-in-law). It was the first shower I have given and I thought we all had a great time. 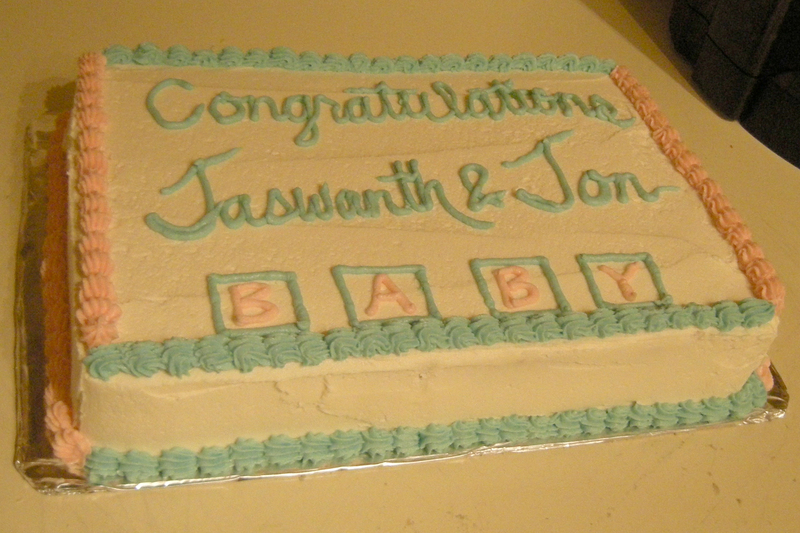 And naturally, I volunteered to make the cake! Jen said she wanted chocolate, but for some reason I didn’t want to do chocolate icing. For one thing, her wedding cake will be chocolate icing, and I wanted to do something different, and for another, I was thinking “light, springy” so I wanted to do something else. After much contemplation, I finally made the decision the week of the shower to go with chocolate cake, cream cheese icing, and chocolate cream cheese filling. I would make the decorations with fondant. I mixed up 3 colors of Wilton’s fondant using Wilton’s colors: blue (Royal Blue and a touch of Black), yellow (a touch of Lemon Yellow), and green (Leaf Green and a touch of Black). I used a tulip cutter and alphabet cutters to make the flowers and the letters. I used a pizza cutter for the flower stems. I’ve decided I love using fondant for decorations. It’s surprisingly easy to work with and I think it looks very nice. I made 2 10″ round chocolate cakes with this recipe. This is my go-to chocolate cake recipe – it is moist, chocolatey, and delicious! I also made a double batch of cream cheese icing and tinted it light blue. I used Royal Blue color, but since the icing itself was slightly yellow-ish due to the butter and vanilla, it came out a little on the green side. And finally, I made a 3/4 batch (I know, odd) of cream cheese icing and added some cocoa powder. This was the filling. I filled and iced the cake using my new offset spatula. Have I raved about this yet? It’s amazing how that tiny little bend in the spatula can make icing SO much easier!! I’ve used it on my past couple of cakes. Anyway, I finished the icing with a bead border. 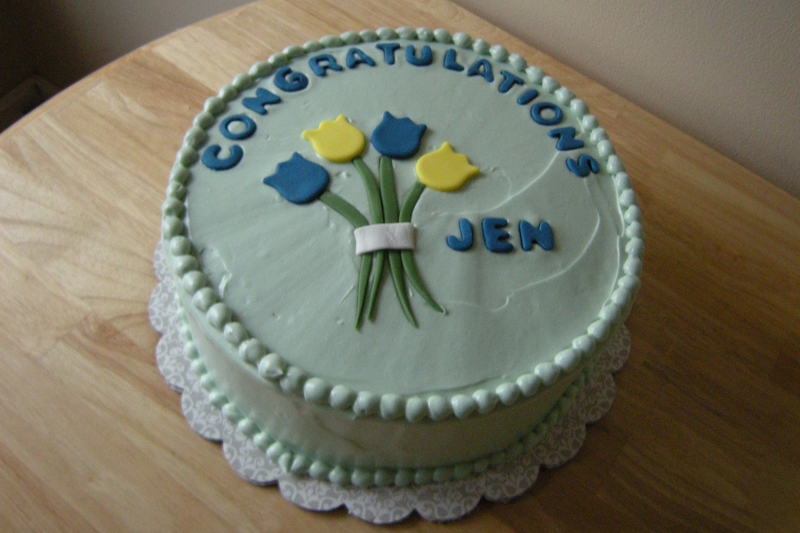 I arranged the fondant letters to spell “Congratulations Jen”. And I arranged the tulips into a bouquet. There’s nothing too elaborate about this particular cake. I made it mid-week, so I didn’t have a lot of time, but it came out well. I used 2 boxes of Funfetti cake mix and made 2 9×13 sheet cakes and stacked them. The icing is Wilton’s buttercream. I mixed up some pink and blue using Wilton’s colors (pastels are so much easier and faster to make than brights!!). PS: Sorry for the crappy picture. The lighting in my kitchen is not so good at 11pm! You are currently browsing the Decorate This blog archives for March, 2010.